I’ve mentioned ‘Annual’ (sometimes called ‘Yearly’) cars before, kits that featured all-new or refreshed models from the full-size Detroit auto companies. For a time AMT, Jo-Han, MPC - and to a certain extent, Revell - matched the showroom glitz with kit versions of their own. 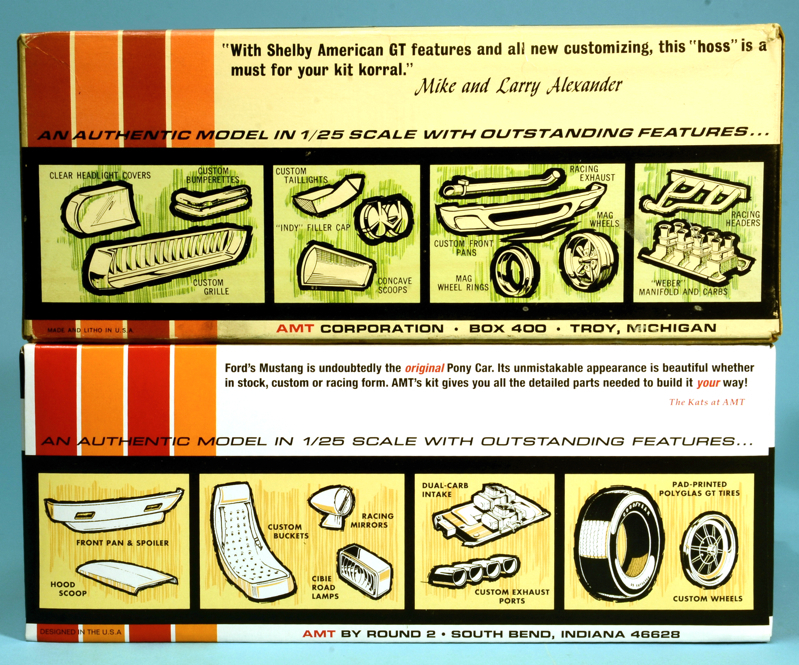 AMT started the Annuals craze in the late 1950s, but the components for each kit were packed into generic, near-identical boxes, the only indication of what was actually inside being a label, sticker, or small insert panel on the box-end. Exactly why the generic styling was used is not entirely clear, though it was most likely a simple economy measure. Whatever the reason, the ‘mystery kit’ packaging lasted only a few years. 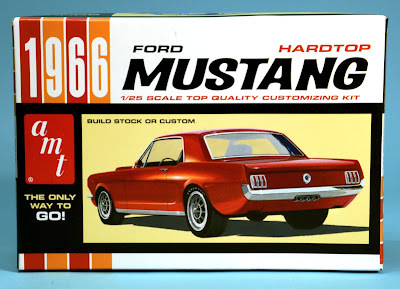 The generic approach stayed until 1963, when, although a standard box-top was used across the range, individual kits now had their own end-panels. 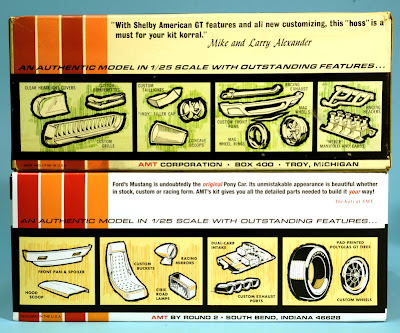 The following year, each model car gained its own box-top art too, although within the framework of an overall graphic style. The 1966 theme was ‘stripes’, which brings me to the recent Round 2 Mustang reissue. 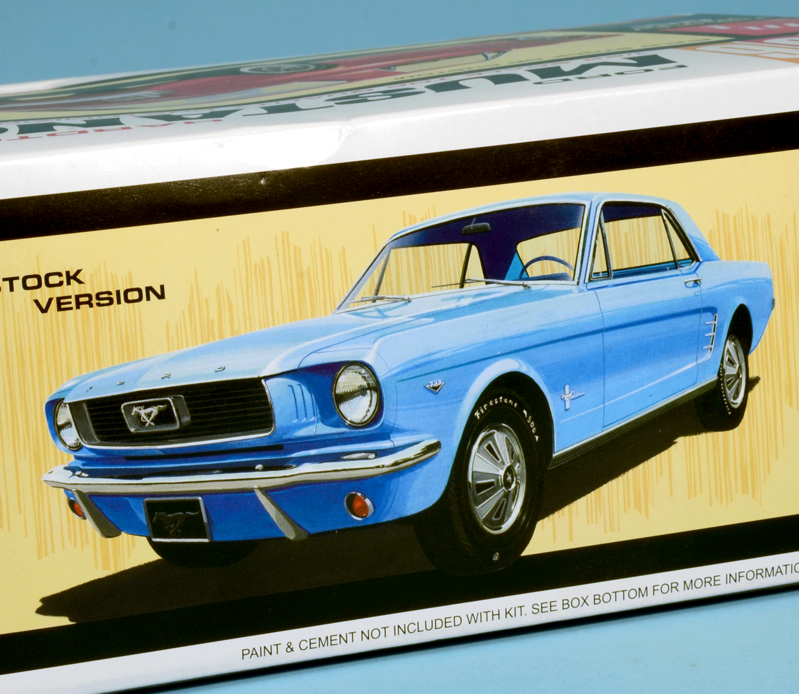 At first glance, the box (above) could be a straight reprint of a 1966 box. But it’s not - quite. For Round 2 has trodden the vintage path, with what it calls a ‘retro deluxe’ look. Essentially, this means taking the basics of an original visual style, then updating it with the latest graphic software to give the box that cool, old-but-new appearance. 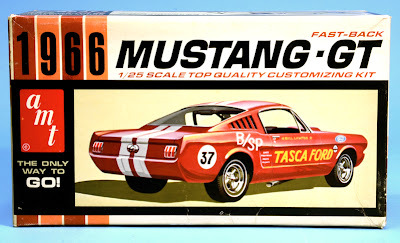 In this case, the design was based on the box of another AMT Mustang, the 1:25 scale Fastback (below). Compare the retro-deluxe design with the actual Hardtop original, a comparatively plain-Jane piece of graphic design that’s beaten hands-down by both the original Fastback box, and Round 2’s retro deluxe version. Well, there’s logic in the design decision - if it looks better, that usually means more sales. Even more interestingly, the plain-Jane version (header pic and below) dates not from 1966, but 1970! 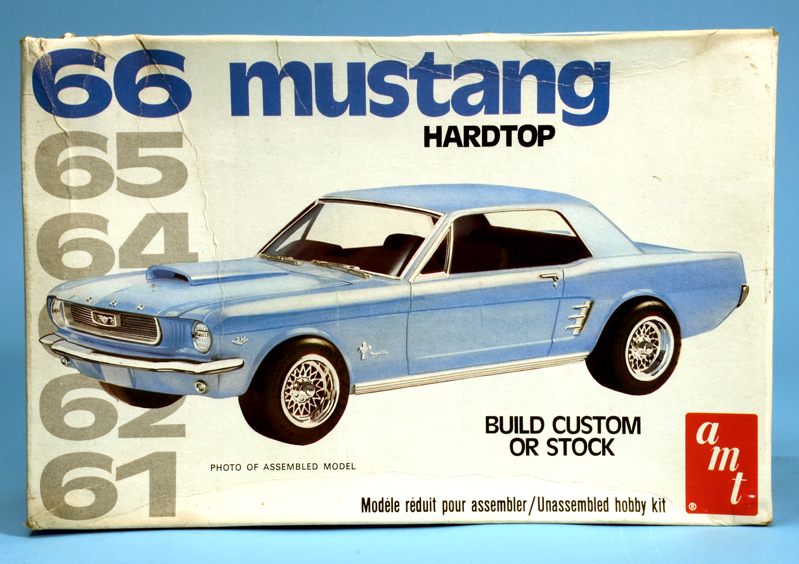 Here we show the side-panel of an original - and rather yellowed with age - 1966 Fastback box (below, top), compared with the current Round 2 Hardtop box. 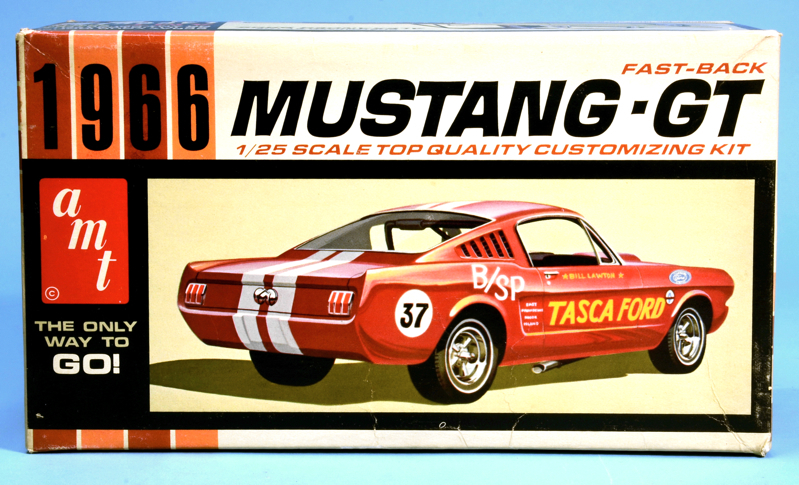 Incidentally, the Round 2 box we show here depicts the Mustang in two colours - red on the box-top, blue on the sides. But if you want something different, try the online Auto World store, where you can also buy a kit that swaps the colours, depicting a blue car on the box-top. Review kit courtesy Round 2 Models. Visit the Auto World store here. Plenty more AMT kits here.